I recently attended the American Society for Colposcopy and Cervical Pathology (ASCCP) Annual Meeting in Las Vegas Nevada to represent Cervivor in the BD exhibitor display area.  BD is one of Cervivor’s sponsors. 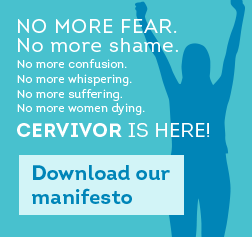 What an amazing experience this was for me as a Cervivor Ambassador! 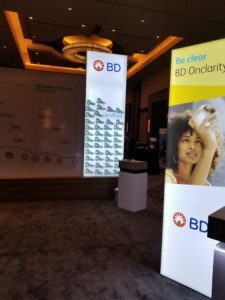 BD had recently received FDA approval for their BD Onclarity™ HPV Assay and they had information in their display area on their product The BD SurePath™; a liquid-based PAP test. 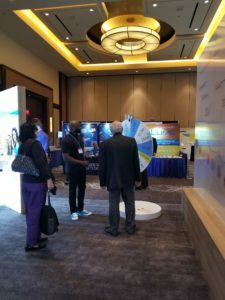 BD was raising funds for Cervivor and had this set up where the attendees would have an opportunity to spin the wheel and whatever dollar amount it landed on would be donated to Cervivor. 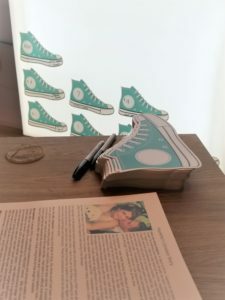 Once they had their turn at spinning the wheel they would fill out their name and the dollar amount on a teal and white sneaker sticker that I would place on the BD/Cervivor display wall. By the end of the meeting we had the wall filled on both sides and $3000.00 was raised for Cervivor! I interacted with many people in the women’s health field about my story and what impact having cancer had on my life. Nearly everyone thanked me for coming out and talking so openly about my cancer journey. It was such an honor for me to be able to share Cervivor and the work we do with this group! 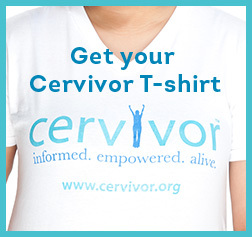 Several shared that they did not know of a resource like Cervivor, where they could direct their patients. One moment that really stood out for me was when an OBGYN I had shared my story with earlier in the day came back after the afternoon sessions and asked to take a photo with me. She told me that she was so moved by my story and willingness to share it that she was going to carry this photo with her. This photo of us together was going to be her reminder about how to treat her patients that were diagnosed with cervical cancer. This literally brought me to tears. I was so touched by this and to know that my story will help other women in her practice is truly heartwarming! 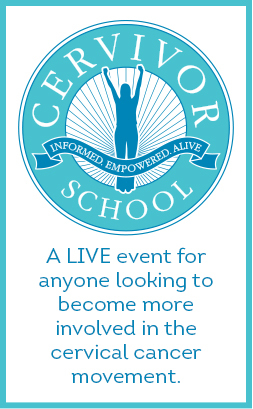 Attending this meeting as a Cervivor Ambassador to represent our organization was such an honor for me. The work being done in women’s gynecologic health is really fascinating and I am excited to know that studies are being conducted and products developed to make some of what we go through less invasive/painful. 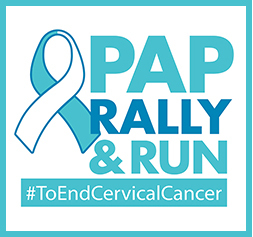 Everyone in this field realizes the importance of early detection, better screening options for women and less invasive procedures as well as the importance of vaccinating against HPV related cancers. Paulette Apostolou resides in Illinois with her loving husband and two rescue Miniature Pinschers. She is the owner/designer of ThePartyDeeva.com and founder of Operation Teal; an awareness ribbon campaign she founded in 2016 after attending Cervivor School Louisville. 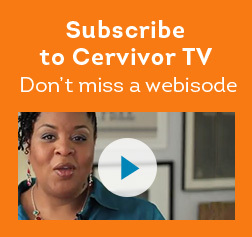 Contact Paulette@Cervivor.org She is available for speaking/advocacy events. 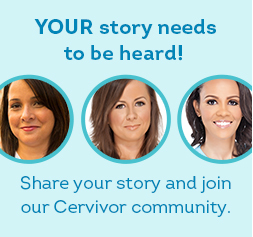 Read her Cervivor Story here. 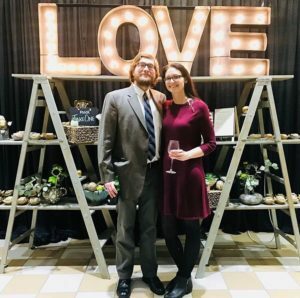 It’s strange to think back on my experience as a husband and father when Mary was in treatment because for most of that time I put myself to the side. Everything was put on pause to focus on making sure she was getting to her appointments, as comfortable as her body would allow, and – on the good days – eating. I’m not complaining. It’s just what you do. When a little kid gets hurt, you run to check on them. When something catches fire, you put it out. And when your wife is diagnosed with cervical cancer that’s spread to her lymph nodes, everything else seems pretty small by comparison. When you’re in an emergency situation, you suddenly become very clearheaded and logical. “Let’s see. The dog is on fire, so that’s probably the first priority. Let’s get a blanket on her. Okay, that’s out. Mental note: call the vet after this. Now the teenager is under a burning rafter and the baby is in the playpen. So yell at the teenager to carry the dog out and grab the baby with one hand and the diaper bag with the other, just in case.” Later, after the emergency is over, your brain exits Survival Mode and lets you collapse into a pile of trauma-flavored Jell-O. For those months between diagnosis and the “all clear” sign, it was an emergency situation. My brain shut down most of my emotions so I could A) better attend to Mary’s needs and B) survive the stress and fear without sinking into despair or having seven simultaneous heart attacks. I’m lucky. My coworkers are very understanding and sympathetic when it comes to family matters and the nature of my job allows me to work from home. Thanks to that, once Mary’s treatment went from surgery to external radiation every weekday, chemo once a week, and several internal radiation torture sessions, I was able to stay home with her and bring my laptop to chemo. What was hard was watching her waste away. That was a sadness I couldn’t turn off. She had no appetite and became weak and skeletal. Walking 20 feet to the bathroom was exhausting for her. It hurt to see her suffer, and I think I used my work as an excuse to sit in the living room to witness her suffering a little less, which I’m not proud of. I never allowed myself to imagine what would happen if she didn’t make it. It’s like asking what you would do after the world blew up. Helping the kids was easier. Our teenager was zealously optimistic. He knew with the certainty of youth that his mom would be fine. I was jealous. Our daughter, on the other hands, buries her emotions (like her dad), so comforting her took some effort. Once she was ready to talk, she appreciated the reassurance, but until then I just told her it would be okay and trust that the words made it into her ears. Their grades suffered, but I couldn’t get upset with them. I was letting the place become a pigsty and slipping some at work myself. You may have heard, cancer is a little distracting. I figured we’d all straighten out when it was over, and we eventually did. A year and a half later, Mary still has trouble. Some lymph nodes were removed, so her legs and feet swell up. She also has some serious anxiety. It’s gotten better, but she has good days and bad days. 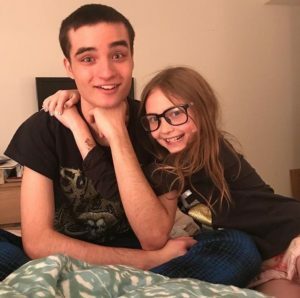 Seeing her struggle made me open up about my own lifelong depression and anxiety, mostly so I could help her. I talk her through bad times if she needs it and we give each other space if one of us needs that. The kids know that sometimes people need alone time and that’s okay. Like many who face death, we came out the other end more focused, like we were forged in the fire. Mary speaks and writes about battling cancer and her volunteering fills me with awe and pride. The kids are more appreciative of basically everything. And I learned that openness is not lethal. We’re all doing things we want to do, skipping things we don’t, and being fuller versions of ourselves. We know that if it resurfaces and she has to go back into treatment, we’ll have a better idea of what to expect and what to ask. We also know the statistics and the odds. But until her next regular oncology appointment, we’re just living life. Dan lives in Richmond, Va. with his wife Mary and their two kids. Dan and Mary met when she started coming to see bands play at his house. She fell madly in love with him after hearing his college radio show which featured terrible music and a fictional wrestling program. Now Dan proofreads credit card websites, which is as exciting as it sounds.